I’ve been watching this fun idea as it’s travelled through the world over the last year or so, waiting for the day it comes to Melbourne. 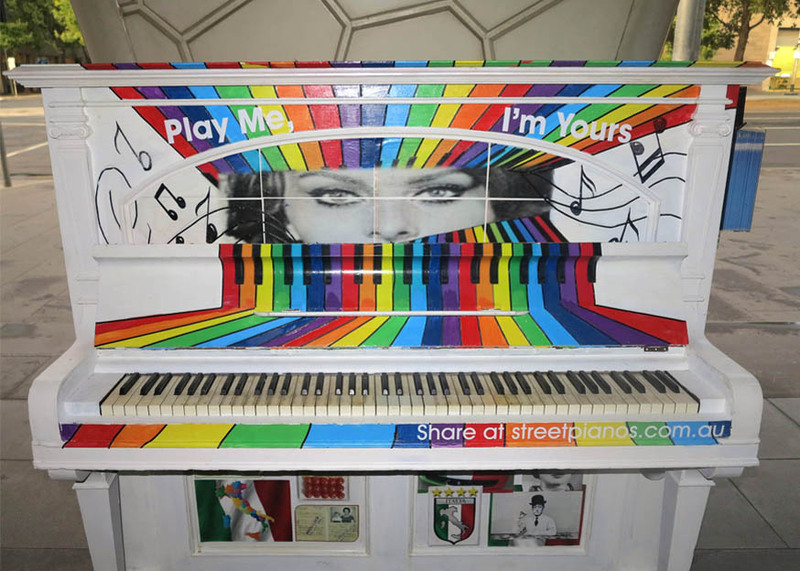 Play me I’m yours is finally here and if you like the sound of 24 pianos like you’ve never heard, each individually (and beautifully) hand painted by 35 local and international artists, all waiting to be admired or played… then get your fingers ready and head down. It’s currently sitting out the front of the Melbourne Arts Centre, all glowing with colour and energy and best of all ready when you are!… but be very quick or you’ll miss them, as they’re rolling onto another destination far, far away on January 27. Brainchild of Luke Jerram back in 2007 from his home town of Bristol. He spent his hard earned cash on this ambitious art installation concept he developed, which involved an orchestra in hot air balloons that would fly over Birmingham one morning, to give a real surround sound experience. Story goes that everybody turned up on the day, but it was too windy too fly, it was a disaster! So it was all called off and Luke was left with many pianos and virtually no money in his pockets… that’s when he came up with the crazy idea of placing pianos all over the city. Each piano has their own endearingly, distinctive personality – one painted with loads of fluffy white clouds… one covered in fake grass and looking like an Alice in Wonderland garden party… another exploding at you in a technicolour rainbow. 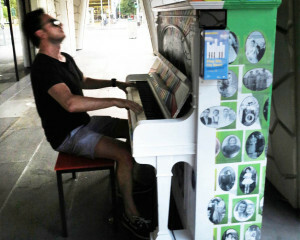 This fun and active installation has so far traveled the world to over 37 countries, from New York City to Bar(thhh)celona, each city with it’s very own representative destination and custom painted pianos to match. So far it’s been placed in parks, train stations… even on ferries! and has reached over three million happy piano playing (and admiring) people. Play me I’m yours say’s ‘hello!’ and encourages you to discover your musical, inner self – even if you’re just looking and playing music on the inside. If you are keen to bust out and express yourself like Stevie, this is your time… After I set eyes on the awesome rainbow piano (pictured) I couldn’t resist dropping into little ‘Lucy in the sky with diamonds!’… On the inside! If you get time, I would really recommend heading on down the Arts Centre for a look, they even have piano lessons if you’re keen, it’s never too late to start.